The Bay of Kotor (Montenegrin: Бока Которска / Boka Kotorska; pronounced [bɔ̂ka kɔ̂tɔrskaː], Italian: Bocche di Cattaro) known simply as Boka ("the Bay"), is the winding bay of the Adriatic Sea in southwestern Montenegro and the region of Montenegro concentrated around the bay. The bay has been inhabited since antiquity. Its well-preserved medieval towns of Kotor, Risan, Tivat, Perast, Prčanj and Herceg Novi, along with their natural surroundings, are major tourist attractions. Natural and Culturo-Historical Region of Kotor has been a World Heritage Site since 1979. Its numerous Orthodox and Catholic churches and monasteries make it a major pilgrimage site. A small naval port is under development as a yacht marina, Porto Montenegro. The bay is about 28 kilometres (17 mi) long with a shoreline extending 107.3 kilometres (66.7 mi). It is surrounded by two massifs of the Dinaric Alps: the Orjen mountains to the west, and the Lovćen mountains to the east. The narrowest section of the bay, the 2,300-metre (7,500 ft) long Verige Strait, is only 340 metres (1,120 ft) wide at its narrowest point. The bay is a ria of the vanished Bokelj River that used to run from the high mountain plateaus of Mount Orjen. The bay is composed of several smaller broad bays, united by narrower channels. The bay inlet was formerly a river system. Tectonic and karstification processes led to the disintegration of this river. After heavy rains the waterfall of Sopot spring at Risan appears, and Škurda, another well-known spring runs through a canyon from Lovćen. The outermost part of the bay is the Bay of Tivat (Teodo). On the seaward side is the Bay of Herceg Novi (Castelnuovo), at the main entrance to the Bay of Kotor. The inner bays are the Bay of Risan to the northwest and the Bay of Kotor to the southeast. The Bay lies within the Mediterranean and northwards the humid subtropical climate zone, but its peculiar topography and high mountains make it one of the wettest places in Europe, with Europe's wettest inhabited areas (although certain Icelandic glaciers are wetter). The littoral Dinarids and the Prokletije mountains receive the most precipitation, leading to small glaciers surviving well above the 0 °C (32 °F) mean annual isotherm. November thunderstorms sometimes drop large amounts of water. By contrast, in August the area is frequently completely dry, leading to forest fires. With a maximum discharge of 200 m3/s (7,100 cu ft/s), one of the biggest karst springs, the Sopot spring, reflects this seasonal variation. Most of the time it is inactive but after heavy rain a waterfall appears 20 metres (66 ft) above the Bay of Kotor. Two wind systems have ecological significance: Bora and Jugo. Strong cold downslope winds of the Bora type appear in winter and are most severe in the Bay of Risan. Gusts reach 250 km/h (160 mph) and can lead to a significant temperature decline over several hours with freezing events. Bora weather situations are frequent and sailors study the mountains as cap clouds indicate an imminent Bora event. Jugo is a warm humid wind and brings heavy rain. It appears throughout the year but is usually concentrated in autumn and spring. The nearby hamlet of Risan was a thriving Illyrian city called Rhizon as early as 229 BC and gave its name to the bay, then known as Rhizonicus Sinus. Queen Teuta of Illyria retired from Shkodra to Rhizon. Rhizon eventually submitted to Rome in 168 BC, at the same time that Acrivium, or Acruvium, the modern Kotor, was first mentioned. The Sklavenoi, South Slavs, settled in the Balkans in the 6th century. The Serbs, mentioned in the Royal Frankish Annals of the mid-9th century, controlled a great part of Dalmatia ("Sorabos, quae natio magnam Dalmatiae partem obtinere dicitur"). The Slavic, Montenegrin tribes, consolidated under the Vlastimirović dynasty (610–960). The two principalities of Doclea and Travunia were roughly adjacent at Boka. As elsewhere in the Balkans, Slavs mixed with the Roman population of these Byzantine coastal cities. The Theme of Dalmatia was established in the 870s. According to De Administrando Imperio (ca. 960), Risan was part of Travunia, a Serbian principality ruled by the Belojević family. After the Great Schism of 1054, the coastal region was officially under the Catholic Church (the West). In 1171, Stefan Nemanja sided with the Venetian Republic in a dispute with the Byzantine Empire. The Venetians incited the Slavs of the eastern Adriatic littoral to rebel against Byzantine rule and Nemanja joined them, launching an offensive towards Kotor. The Bay was thenceforth under the rule of the Nemanjić dynasty. In 1195 Nemanja and his son Vukan constructed the Church of Saint Luka in Kotor. In 1219 Saint Sava founded the seat of the Eparchy of Zeta on Prevlaka, one of the eparchies of the Serbian Orthodox Church. Due to its protected location, Kotor became a major city for the salt trade. The area flourished during the 14th century under the rule of Serbian emperor Dushan "The Mighty" who, notorious for his aggressive law enforcement, made the Bay of Kotor a particularly safe place for doing business. The city of Kotor was under Nemanjić rule until 1371. It was followed by a period of frequent political changes in the region. Local lords from Vojinović and Balšić noble families fought over the influence in the region. Since 1377, northern parts of the Bay region came under the rule of Tvrtko I Kotromanić, who proclaimed himself King of the Serbs and Bosnia. For several years (1385-1391), the city of Kotor also recognized the suzerainty of the Kingdom of Bosnia. After 1391, it gained political independence, and functioned as a city-state until 1420. Its merchant fleet and importance gradually increased, but so was the interest of the powerful Republic of Venice for the city and the bay region. From 1405 to 1412, the First Scutari War was fought in the region. In 1420, the city of Kotor recognized the Venetian rule, marking the beginning of an era that would last until 1797. Northern parts of the Bay region still remained under the Kingdom of Bosnia, while southern parts were controlled the Lordship of Zeta, followed by the Serbian Despotate. In the meanwhile, the Second Scutari War was fought in the region, resulting in the peace treaties of 1423 and 1426. With the Ottoman expansion in the Southeastern Europe and the fall of the Serbian Despotate in the 15th century, Venetians started to expand into the Bay. 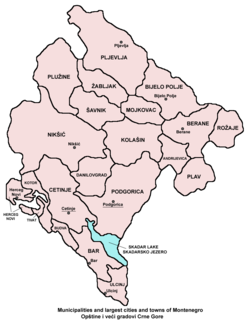 The plurality of Boka's citizens were Serbian Orthodox, under the jurisdiction of the Metropolitanate of Zeta. Venetian rule brought Italian language and culture to Boka, which was partially accepted by its population. Throughout Venetian rule, repeated assimilation attempts of the Slavs failed. In 1451 and 1455 the Venetian Doge issued orders to the Bishop of Kotor to work to convert the Orthodox under his jurisdiction and to confiscate their property. The Venetian governor of Kotor banished all Orthodox from Bogdashich and Kavchani and committed serious atrocities on Prevlaka in 1672. By the middle of the 15th century, northern parts of the Bay region became incorporated into the Duchy of Saint Sava. In 1482, Ottomans took the city of Novi, establishing their rule in the northern parts of the Bay area. Under Ottoman rule, those regions were attached to the Sanjak of Herzegovina. The Ottoman possessions in the Bay region were retaken at the end of the 17th century and the whole area became part of the Venetian Republic, within the province called the Albania Veneta. Until the 20th century the difference between the two parts was visible because the former Ottoman part had an Orthodox majority, while the part that was under Venetian rule had a Catholic majority. The town of Perast had difficult moments in 1654 when the Ottomans attacked, retaliating against Bokeljs who had sunk an Ottoman ship. The Bokeljs' successful defence of Perast and Boka received attention all over Europe. It attracted Petar Zrinski, a statesman in Europe who had fought dramatic battles with the Turks. During his three-day sojourn in Perast he presented his legendary sword to the town in recognition for their efforts to defend their homeland, and to stop the Ottoman Empire. In 1669, according to Andrija Zmajević, hajduks of the Bay wished to build a church, but were denied due to Zmajević's intervention on the providur of Kotor and captain of Perast. By the Treaty of Campo Formio (1797), the Bay region came under the Habsburg rule. By the Treaty of Pressburg (1805), the region was set to be transferred to the French rule, but that was effectively achieved only after the Peace of Tilsit (1807). Under the French rule, the Bay region was included in the Napoleonic Kingdom of Italy and later in the Illyrian provinces, which were a part of the French Empire. The region was later conquered by Montenegro with Russian help by Prince-Bishop Petar I Petrović Njegoš and, in 1813, a union of the bay area with Montenegro was declared. In 1815, the bay was annexed by the Austrian Empire (Austro-Hungary since 1867) and was included in the province of Dalmatia (part of Cisleithania since 1867). In 1848, when the numerous revolutions sparked in the Austrian Empire, an Assembly of the Gulf of Kotor was held sponsored by Petar II Petrović-Njegoš of Montenegro, to decide on the proposition of Boka's unification with Croatian Ban Josip Jelačić in an attempt to unite Dalmatia, Croatia and Slavonia under the Habsburg crown. The Assembly brought the decision that "The Gulf of Kotor, according to its location, history, language and tribal majority belongs to Serbs". The Serb National Guard of Kotor however refused the proposition and Stefan Mitrov Ljubiša wrote in the name of the Assembly to the Croatian Parliament in Zagreb and to Njegoš that they refused the option to join Croatia, stating that they would rather first await the national unification of Serbs and then that of all South Slavs. He also stated that "The people of Boka Kotorska are pure Serbs". In the early 20th century Boka's character was considered Yugoslav. The Kingdom of Montenegro attempted to take the bay during World War I. It was bombarded from Lovćen, but by 1916 Austro-Hungary had defeated Montenegro. During Austro-Hungarian rule majority of people participated on retreat with Serbian army through Albania. On 7 November 1918 the Serbian army entered the bay. Within a month, the Kingdom of Serbs, Croats, and Slovenes was formed and was renamed as Yugoslavia in 1929. The bay was a municipality of Dalmatia until it was re-organized into smaller districts in 1922. It was incorporated into the Zeta Area and from 1939 Zeta Banate. After the assassination of King Alexander in Marseilles, nationalist Croat politicians talked of Croatian regional autonomy, the Croatian Banate, that was to include 8 settlements in Boka that hosted a Catholic majority. At that time, a little below a quarter of the population identified as Catholics, and the Croatian viewpoint was that the Boka Catholics were ethnic Croats. The Catholics have mainly adopted a Croat national identity. According to the 1910 census, the bay had 40,582 inhabitants, of whom 24,794 were Orthodox Christians and 14,523 Catholics. The Bay region was occupied by the Italian Army in April 1941 and was included in the Italian Governatorato di Dalmazia until September 1943. Since 1945, it has been part of the Republic of Montenegro. Most of the region's inhabitants are Orthodox Christians, declaring themselves on census forms as either Serbs or as Montenegrins, while a minority are Croatian. The Bay region is under the protection of UNESCO due to its rich cultural heritage. The Boka region has a long naval tradition and has harbored a strong naval fleet since the Middle Ages. The fleet peaked at 300 ships in the 18th century, when Boka was a rival to Dubrovnik and Venice. On the landward side, long walls run from the fortified old town of Kotor to the castle of Saint John, far above; the heights of the Krivošije (Krivoscie), a group of barren plateaus in Mount Orjen, were crowned by small forts. The shores of the bay Herceg Novi house the Orthodox convent of St. Sava near (Savina monastery) standing amid surrounding gardens. It was founded in the 16th century and contains many specimens of 17th century silversmiths' work. 12.87 km east of Herceg Novi, there is a Benedictine monastery on a small island opposite Perast (Perasto). Perast itself was for a time an independent state in the 14th century. Today Boka has about 100 Catholic churches and chapels and about 200 Orthodox churches and chapels, as well as some Orthodox monasteries. The Cathedral of St. Trifun in Kotor is Boka's oldest cathedral, built in 1166. The churches of St. George and Lady of Škrpjel (near Perast) were built on two of the bay's islets in the first half of the 17th century. The Bokelj or Bokez (Бокељ, Бокез) people (pl. Бокељи, Bokelji, or Бокези, Bokezi) are the inhabitants of the Boka Kotorska (hence the name) and adjacent regions (near the towns of Kotor, Tivat, Herceg Novi, Risan, Perast). They are an ethnic South Slavic community, many of whom nationally identify as Montenegrin, Serb or Croat, or others. Most are Eastern Orthodox, while some are Roman Catholics. Saint-George and Our-Lady-of-the-Reef, two islands off Perast. Kotor bay from St John Castle. ^ D Magaš. Natural-Geographic Characteristics of the Boka Kotosdka Area As the Basis of Development. Geoadria Vol. 7 No. 1, Croatian Geographical Society and University of Zadar Department of Geography, Zadar, 2002, pp. 53. ^ "Late Holocene Glacial History of Sólheimajökull, Southern Iceland" (PDF). Archived from the original (PDF) on 2014-03-20. ^ Popović 2002, p. 173. ^ Ćirković 2004, p. 92. ^ Ćirković 2004, p. 185. ^ Miloš Milošević (1988). Hajduci u Boki Kotorskoj 1648–1718. CANU. ^ Marko Jačov (1992). Le Missioni cattoliche nei Balcani durante la Guerra di Candia (1645–1669). Biblioteca apostolica vaticana. pp. 709–. ISBN 978-88-210-0638-8. ^ Ćirković 2004, p. 187. ^ "[Projekat Rastko – Boka] Simo Matavulj – Boka i Bokelji". rastko.org.rs. Archived from the original on 24 September 2015. Retrieved 31 May 2015. ^ "Slavni "Kapetani Boke kotorske"". Radio DUX. Retrieved 31 May 2015. Boka kotorska: Etnički sastav u razdoblju austrijske uprave (1814.-1918. g.), Ivan Crkvenčić, Antun Schaller, Hrvatski geografski glasnik 68/1, 51–72 (2006). Wikimedia Commons has media related to Bay of Kotor. This page was last edited on 12 April 2019, at 09:23 (UTC).